Why can't astronauts have bread? NASA says so, that's why, NASA and their overly controlling ways. Actually, it turns out there's a pretty good reason - crumbs float everywhere, eventually into control devices, where they could start fires! But now, there's hope. Astronauts could soon be waking up to the smell of freshly baked bread. A new dough mixture and oven specially designed for use on the International Space Station will be tested during a mission next year. 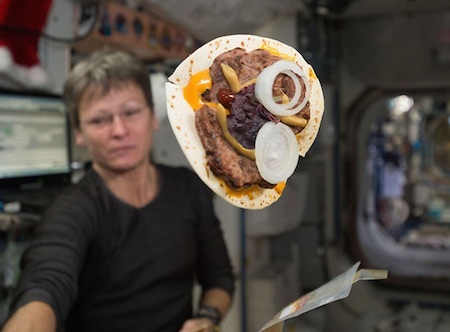 Bread is a staple food on Earth but can be life-threatening in space. The first and last people to enjoy bread in space were the two astronauts on NASA’s 1965 Gemini 3 mission, who shared a corned beef sandwich one of them had smuggled on board. The crumbs flew everywhere in the microgravity and could have got into their eyes or into the electrical panels, where they could have started a fire. 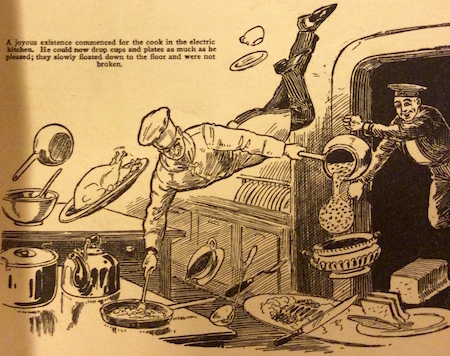 Science fiction writers have had fun with the whole idea of cooking in space. In his 1929 classic The Shot Into Infinity, Otto Willi Gail gave some thought to the idea of cooking in space. All objects lost weight, apparently. Limbs became free and light, while there was no alteration in the muscular power which was attuned to terrestrial conditions.... A joyous condition commenced for the cook in the electric kitchen. He could now drop plates and cups as much as he pleased; they slowly floated down to the floor and were not broken.